The global erectile dysfunction (ED) drugs market is expected to post a CAGR of over (4)% during the period 2019-2023. The market is expected to decelerate on a year-on-year basis during the forecast period. With the increasing health consciousness across the globe, there has been a significant increase in healthcare spending for sexual wellness. The physical and hormonal changes in the body associated with aging, lead to a decrease in libido, a side-effect of ED. Hence, ED is more common among the geriatric population, and there has been a rise in the demand for ED drugs among this population. Moreover, the therapeutic benefits of these drugs, such as longer half-life in the body and the ease of administration even via the sublingual route, are expected to drive the adoption of ED drugs. The rising cyberpornography and the increasing number of advertisements for the treatment of ED are also expected to drive the growth of the market during the forecast period. As per Technavio, the presence of novel drug formulations in the late stages of development will have a positive impact on the market and contribute to its growth significantly over the forecast period. 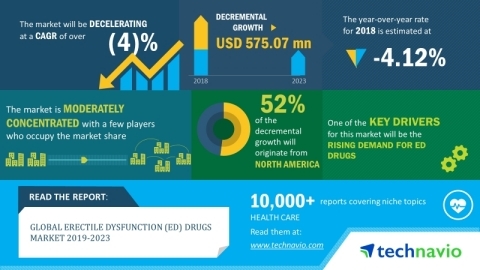 This global erectile dysfunction drugs marketresearch report also analyzes other important trends and market drivers that will affect market growth during 2019-2023. Currently, the market is dominated by the oral formulations of the drugs used for the treatment of ED. However, during the forecast period, several novel formulations of ED drugs, such as topical gels, injectables, and suppositories, are expected to emerge in the market. These novel formulations will attract a large number of patients, owing to their therapeutic benefits. They are also expected to widen the scope of treatment for ED. "Apart from the presence of novel drug formulations in the late stages of development, the rising awareness of ED is increasing across the globe as it is an underdiagnosed and undertreated disorder. To overcome the lack of awareness regarding the conditions that lead to ED, several organizations, healthcare agencies, and government bodies are also focusing on improving the quality of life of the patients, which will boost the growth of the global erectile dysfunction drugs market," says a senior analyst at Technavio. This market research report segments the global erectile dysfunction drugs market by product (topical drugs and oral drugs) and geographical regions (North America, Europe, Asia, and ROW). The North American region led the market in 2018, followed by Europe, Asia, and ROW, respectively. However, this region will exhibit a slow growth rate as compared to the rest of the regions in the forecast period.